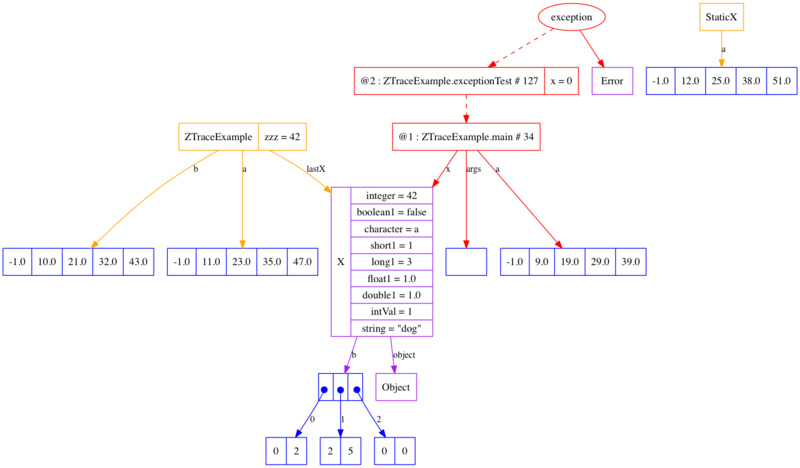 Here is some software to make visualizations of Java code, using graphviz. For example, to draw every step of your running program, simply add the following two lines to the beginning of the main function. Null references are not shown (configurable for objects via Trace.showNullFields). There are several ways to create drawings. drawSteps() will start drawing all steps of the program. 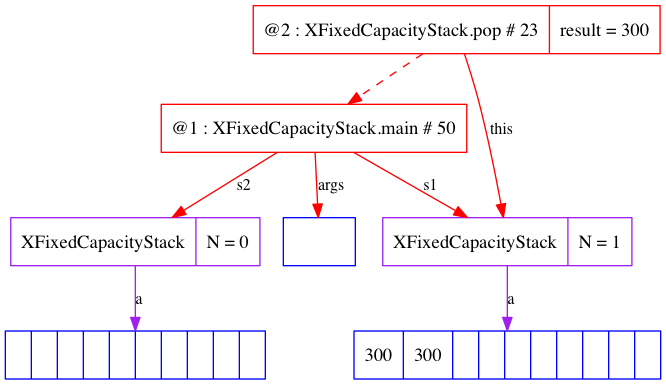 See main1 in XFixedCapacityStack.java for an example. drawStepsofMethod(String methodName) will start drawing all steps of the given method. 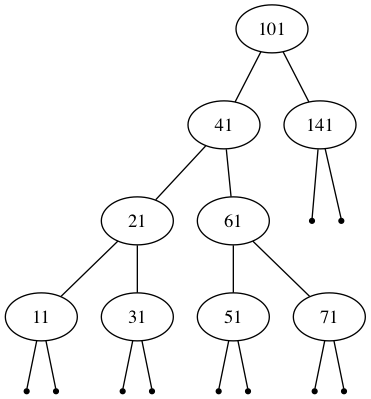 drawStepsofMethods(String... methodName) will start drawing all steps of the given methods. For example, drawStepsofMethods("push", "pop") . drawStepsEnd() will stop drawing steps begun by any of the preceding drawSteps methods. You can alternate calls to drawStepsEnd and the drawSteps methods to dynamically select portions of the code. The restrictions imposed by drawStepsofMethod and drawStepsofMethods are erased by drawStepsEnd. Thus drawStepsEnd(); drawSteps() will draw the steps of all methods, regardless of prior calls to drawStepsofMethod. If you do not call any of the drawSteps methods, nothing will be drawn unless you do so explicitly. You can do this by calling Trace.draw(). Whenever the debugger comes to a call to Trace.draw(), it creates a picture of the state. Trace.drawThisFrame() will draw only the current stack frame (and objects reachable from it). There are also versions to draw named objects, such as Trace.drawObjectsWithNames. There are lots of options. See the javadoc for details. One useful option is Trace.setGraphizOutputDir(dirName), which allows you to change where the drawings are place on your system. By default they go on the user Desktop. You can specify an absolute or relative path for dirName. Relative paths are interpreted with respect to the user home directory. Methods that being with draw may be called at any time. 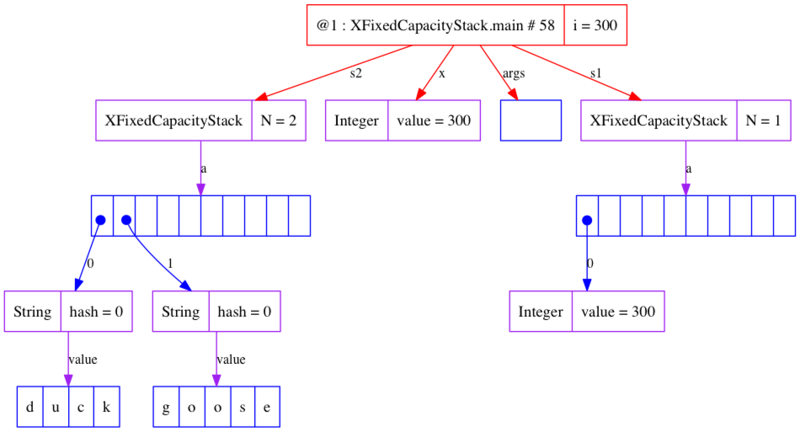 Other option methods must be called before Trace.run() in order to have any effect. Thus Trace.run(); Trace.showBuiltInObjects(true) is the same as Trace.run() . Correct usage is Trace.showBuiltInObjects(true); Trace.run() . To install, you need tools.jar from your JDK installation (or from here), as well as the following two files. The socket file is necessary on some operating systems to avoid problems with reverse DNS. Install it if you are having trouble getting an exception that says that the debugger cannot be started. A related project is GraphvizBuilder.java (javadoc).